Jim McCaul -- Orders for production floaters have finally begun to flow. The break came early this year when contracts for a production semi for use in the GOM and an FPSO for use off Malaysia were awarded. These contracts ended a dry spell of orders that extended over eighteen months. Then within the past month contracts were awarded for an FPSO and TLP for use in SE Asia. And over the next few months an FLNG for offshore East Africa and several FPSO contracts for Brazil will be awarded. We believe these orders are the precursor of a takeoff in deepwater activity over the next several years. The question is how steep the takeoff trajectory will be. There are many deepwater projects in the planning queue awaiting a market signal to justify an investment decision. But the industry downturn over the past two years has eroded available liquid resources for investment new projects. And quick return shale project investment is drawing oil company capital resources from deepwater projects. Overall, the net impact of these changes is slightly negative – but the outlook for a ramp up in production floater orders remains bullish. We now anticipate orders for 32 FPSOs and 8 FPUs over the 2017/21 time period – 2 fewer units than the WER October 2016 forecast. 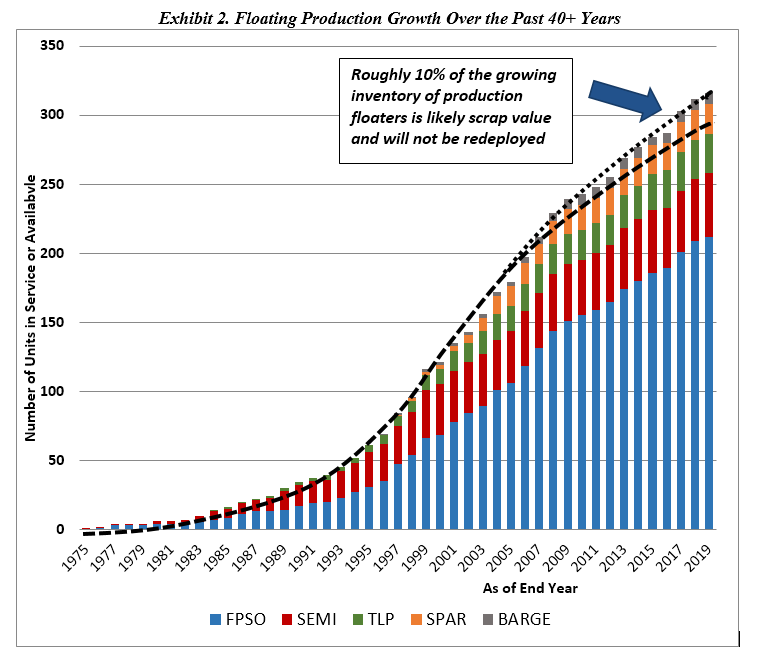 The reduction is the result of several FPSO orders being pushed beyond the five year forecast window. Similar to our October forecast, we continue to anticipate orders for 25 LNG regasification floaters and around 25 FSOs over the next five years. There is certainly no shortage of prospective deepwater projects. In the March WER report we identify 73 FPSO/FPU projects that have potential to move to the development stage through end-2021. They are all announced discoveries capable of moving to the EPC contracting stage over the next five years – i.e., a physical backlog of potential project starts. The projects are segmented into three time periods for possible investment decision – within the next 18 months, next 18 to 36 months and 36 to 60 months out. But timing of the EPC contracting decision depends on the underlying business drivers – and at $50-$55 oil only a portion (~55%) are expected to proceed to a FID over the next five years. All of the above is described in detail in the latest WER report.